Bobrovsky worked with goaltending coach Manny Legace in Washington this morning while the rest of the team did not have a morning skate, according to NHL.com’s Tom Gulitti, suggesting that Bobrovsky is ready to return to the team. Of course, it seems more and more likely that Bobrovsky is heading elsewhere when the season ends unless the team truly considers moving him at the trade deadline. However, while many have suggested that Bobrovsky is heading to the New York Islanders this offseason, New York Post’s Larry Brooks suggests that Islanders’ general manager Lou Lamoriello may already have a different plan with the impressive play of Robin Lehner so far this year. The scribe writes that Lamoriello has an amazing knack for finding impressive goaltenders throughout his tenure, including Martin Brodeur, Cory Schneider and Frederik Andersen as well as Lehner. The New York Rangers took another hit today as the team may have lost defenseman Fredrik Claesson for some time after Saturday’s game against the Islanders, according to the New York Post’s Brett Cyrgalis. Claesson hit the boards hard after a hit by the Islanders’ Matt Martin. While nothing official has been announced, head coach David Quinn said it “doesn’t look good.” Quinn also added that defenseman Neal Pionk could be ready Sunday to replace Claesson in the lineup although he’s still considered day-to-day. While the Philadelphia Flyers sent off forward Jordan Weal Friday to Arizona, The Athletic’s Charlie O’Connor (subscription requried) writes that the team made the move because the 26-year-old was no longer in the team’s plans. The team got little in return other than a sixth-rounder and defenseman Jacob Graves, a 23-year-old currently playing in the ECHL, and included because the Coyotes were already at 50 contracts and needed to send one back in the deal. Weal, a favorite of former general manager Ron Hextall, was deemed expendable by new management, but the improved play of Phil Varone also may have had quite a bit to do with the move. Varone, a similar player to Veal, has played in 14 of the team’s last 17 games, while Weal has been a healthy scratch often of late. Fortunately for both Nyquist and the Red Wings, the 29-year-old is off to a strong start to his season with a dozen points through the first 14 games which is the second-most on the team. If he can maintain that level of play between now and the deadline, not only will that help his negotiating leverage for the summer as he looks to improve upon his current $4.75MM AAV but it would also help Detroit land another notable asset in their rebuilding process. Canucks center Elias Pettersson is off to a very strong start to his rookie season with nine goals and six assists through his first nine games. Accordingly, he is quickly becoming a candidate to hit more than just his Schedule ‘A’ bonuses. Sportsnet’s Chris Johnston provides the breakdown of his Schedule ‘B’ bonuses and notes that the full $2MM can be reached by winning any major award other than the Calder Trophy or being top-ten in the league in goals, assists, or points per game. Fortunately for Vancouver, they sit with nearly $6MM in cap space so if Pettersson’s torrid run continues and he hits one of those marks, they will be able to absorb it this season without having to worry about using the bonus cushion to defer it to next year. It seems like Rangers defenseman Adam McQuaid will be out longer than expected. Head coach David Quinn acknowledged to reporters, including NHL.com’s Dan Rosen (Twitter link), that the lower-body injury the blueliner is dealing with is different than what they had originally thought. As a result, he has been downgraded from day-to-day to week-to-week. New York does not plan to bring someone up from the minors to take his spot on the roster as Fredrik Claesson (upper body) is nearing a return to the lineup. With the team in quick rebuild mode, there are some entry-level deals already and if the team continues to trend in that direction, they will have quite a bit more. The team’s most prominent player at the NHL level to date would be Buchnevich, who improved on his rookie campaign with a 14-goal, 43-point season last year. He saw more ice time as well, improving from 13:16 ATOI to 15:01 as well as saw significant time on the team’s power play, potting five goals and 11 assists with the man advantage and has earned himself a solid spot in the team’s top-six. Another improved season could see him being an expensive restricted free agent. The team has high expectations for their two 2017 first-rounders in Andersson and Chytil. Both have shown excellent skills and have received some time playing for the NHL with Andersson seeing seven games, while saw nine games. Both are expected to earn time with the Rangers out of training camp, but both may find themselves on bottom-six lines unless they can prove that they can center the second or third lines in training camp. The team agreed to a one-year deal with Hayes, avoiding arbitration, but now face the possibility that Hayes could walk away at the end of the season as he will be unrestricted, which will force the team into two possible directions, including attempting to work out a long-term deal with the team after Jan. 1, 2019, or trading him, possibly at the trading deadline if the two sides can’t agree on anything. Hayes, who has been a jack of all trades playing multiple positions, seems to have developed into a solid center as he produced his best season ever, which included 25 goals, eight more than any previous year. The question is, do the Rangers view him as a fixture in their lineup as they continue to rebuild? At age 30, Zuccarrello still puts up solid numbers, but despite the high-end minutes that the veteran gets, he falls into a similar category to that of Hayes where you have to ask whether he is in the team’s long-term plans. The winger is penciled in to play on the team’s top line once again, but has only put up 31 goals over the past two seasons. He does produce quite a few assists (81 over the past two years), but what the Rangers need more than anything is goals. Zuccarello will also turn 32 before he begins his next contract and at that age, how long are the Rangers willing to commit to him? Kreider is coming off a tough year in which he had to deal with blood clots and had surgery to relieve the pressure and missed almost two months of time. The 27-year-old didn’t have as solid of a season as he tallied just 16 goals in 58 games, which is a far cry from the 28 goals he scored in 2016-17 although a lot of that is due to the fact that his playing time dipped as the team didn’t want to play him too many minutes due to the blood clot issue. 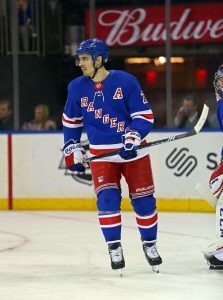 Regardless with a full offseason to rest and recuperate, Kreider should be able to bounce back as one of the team’s top scorers. The team also have high expectations from two other forwards that the team acquired through at the trade deadline a year ago in Namestnikov and Spooner. Namestnikov was the biggest name to arrive in New York in the Ryan McDonagh trade with Tampa Bay. He was a key player for the Lightning, posting 20 goals and 44 points with them, but he actually lost playing time once he arrived in New York and put up just two goals and four points in 19 games. The team hopes that a new coach and proper training camp with his new team will make quite a difference. Spooner came over in the Rick Nash trade with Boston and has posted solid numbers with the Bruins over the past few seasons and could turn out to be a top-six wing or third-line center in New York. Between the two teams, Spooner combined for 13 goals and 28 assists. The team also expect big things from Vesey, who signed as a undrafted collegiate free agent a couple of years ago and if finally starting to show that he belongs in the NHL. The 25-year-old winger has put up solid numbers for two years, but could find himself getting more opportunities in the team’s rebuild. In two years, he’s combined for 33 goals and 55 points. Lundqvist has made it clear he wants to stay with the Rangers, rebuild or not, but his numbers have steadily declined over the past four years when he posted a 2.25 GAA in 2014-15. However, those numbers have dropped each year to 2.48 in 2015-16, 2.74 in 2016-17 and finally to 2.98 GAA in 2017-18. Granted the defense that has surrounded the veteran has been horrible, but if Lundqvist can’t start rebounding, the team will have to find someone else to take some of his load in the future. With a team looking to rebuild, the team does have quite a few contracts that suddenly don’t look that good anymore when it comes to their offseason signings last year of Shattenkirk and Smith. Shattenkirk put up solid numbers to start the season, but dealt with a knee injury in January and was eventually shut down. Regardless, the team can only hope the 29-year-old can bounce back and quarterback their offense, which was lacking this season. Smith, however, came into camp out of shape and struggled immensely before the team finally buried his contract in the AHL. Supposedly, Smith has been working out all summer and is expected to earn back a roster spot for this year. Zibanejad is another center who seems to fall into a long line of players who fans wonder whether he’s good enough to be their future No. 1 playmaker. The 25-year-old, however, had a solid season, posting 25 goals and 47 points as their top-line center. He is locked up for another four years, so he’s likely to stay there unless Andersson and Chytil develop into that elite center the team has been looking for years. Skjei signed his extension over the summer, and is expected to be a key contributor to the team for years. However, the problem is that Skjei regressed last year after a big rookie season. Whether it had something to do with the coaching or their defensive system or whether he wasn’t ready for a big role on the team’s defense, Skjei struggled to produce points, posting just 25 points after scored 39 the previous year. Regardless, most feel that Skjei will bounce back and be one of the team’s top defensemen over the next few years. The Rangers future, however, looks bright as they have no contracts that will hold the team hostage in four years, meaning New York can build their future now and sign their best players without having to worry about big contracts weighing down their team. Granted, the team still must deal with four big contracts in Shattenkirk, Smith, Staal and Lundqvist for the next three years, but hopefully the team and new coaching staff can get more out of that group next year. Regardless, if the team can develop talent, they are in good long-term position to rebuild this franchise. The New York Rangers have added a depth defenseman, signing Fredrik Claesson to a one-year, $700K contract according to Bob McKenzie of TSN. Claesson wasn’t given a qualifying offer by the Ottawa Senators, and reached unrestricted free agency for the first time. The 25-year old Claesson is a worthwhile gamble for the Rangers, who will retain his rights as a restricted free agent at the end of the contract. After showing well in a limited role in 2016-17, Claesson struggled to really make an impact for the Senators last season and recorded just seven points in 64 games. That made him expendable as the team attempts to rebuild its blue line with or without Erik Karlsson, and this time it’s to the Rangers benefit. A $700K commitment is basically risk-free, as it can be completely buried in the minor leagues if necessary. If Claesson does prove his 2016-17 is closer to his true talent, the Rangers have added a good all-around defenseman for a reasonable price. The team is working to rebuild their team with more youth and speed, and will ask the former Senator to battle with Marc Staal and John Gilmour for playing time on the left side. At the very least he offers a good injury replacement for the team, or a high-end defenseman for the Hartford Wolf Pack. Free agency is now a little more than a month away from opening up and there are quite a few prominent players set to hit the open market while many teams have key restricted free agents to re-sign. Here is a breakdown of Ottawa’s free agent situation. Key Restricted Free Agents: D Cody Ceci – While Ceci may not be universally loved by the traditional scouting or analytics community, his role on the Senators is clear. He’s expected to anchor the shutdown second pair and allow Erik Karlsson’s unit to play more offensively against weaker competition. Ceci logged over 23 minutes a night last season, easily registering more short-handed time than any other player for the Senators. His 2:46 of penalty killing time every night was a minute more than any defenseman expected to be with the club next season, with only Dion Phaneuf (now with the Kings) and Johnny Oduya (free agent) closer than Ben Harpur’s 1:43 average. That’s a heavy load for Ceci under noted defensive coach Guy Boucher, and one that has limited any offensive upside he showed as a young player. Ceci recorded just 19 points last season, with only 14 of those coming at even-strength. That doesn’t give him a lot of firepower when going into contract negotiations, as defensive metrics are harder to argue. Still, he should see a raise on the $2.8MM he earned in 2017-18, especially if he signs long-term. Ceci is on track to become an unrestricted free agent in the summer of 2020 since he started his career so young, meaning anything longer than a two-year contract will be buying out UFA years. 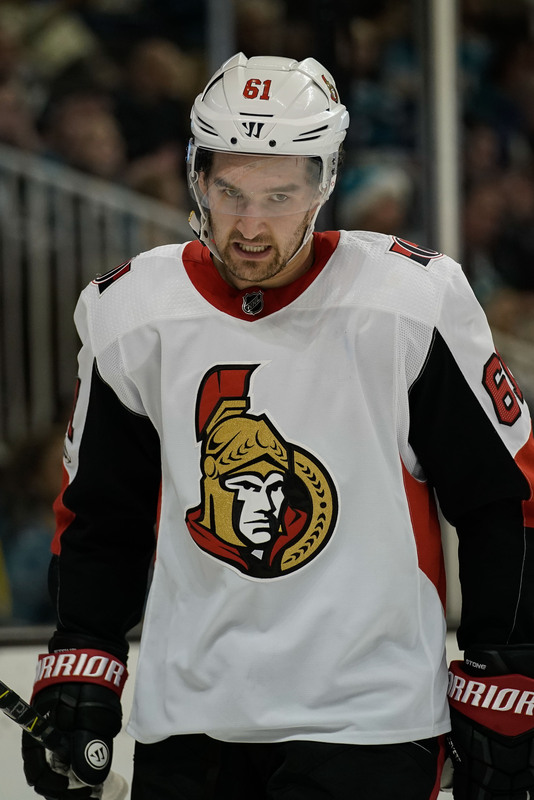 F Mark Stone – Though Ceci is important, it all comes down to Stone this summer for the Senators as they look to lock up their best offensive player. Any contract Stone signs will send him to unrestricted free agency at its conclusion, meaning both sides will probably be looking for a long-term deal. The 26-year old is coming off arguably his best season even though he played in just 58 games due to injury, as he was more than a point-per-game player during those contests. With 62 points on the year he registered his fourth consecutive 20+ goal, 50+ point season and is one of the league’s top takeaway artists, able to strip the puck from unsuspecting defensemen with ease. Nearly everyone that watches the Senators on a regular basis realizes that Stone is an elite player in the NHL, but unfortunately for the club (and their frustrated ownership) that doesn’t necessarily mean that he’s very well-known around the league to fans of other teams. That might help them in negotiations, as his lack of All-Star notoriety may keep his cap hit relatively reasonable. After earning an average of $3.5MM for the past three seasons, it’s not out of the question that he could double his salary should he sign long-term, and end up with a contract like Evander Kane’s recent seven-year, $49MM deal. Key Unrestricted Free Agent: D Chris Wideman – If Ceci has been overused in his time in Ottawa, the opposite could be said for Wideman who despite good possession statistics and excellent offensive pedigree has averaged just under 14 minutes a night during his Senators career. This season was even more disappointing for the 28-year old defenseman, as he tore his hamstring in November and played only 16 games all year. He had eight points in those 16 contests, showing off the ability that made him a 61-point player in the AHL in 2014-15, but never could return before the end of the year despite his hard rehab schedule. Wideman seems like he’s destined to go unsigned by the Senators, unless of course they’ve made the decision to trade Karlsson after all. If they do end up moving their captain, bringing back a good puck-moving right-handed defenseman like Wideman makes a lot of sense. Otherwise there isn’t a lot of room for him on a club that looks like it will have at least six NHL defensemen already under contract. Perhaps since he missed most of the season Wideman wouldn’t be looking for much of a raise on his $800K salary from 2017-18, but with the free agent market thin on talent from the right side there ought to be plenty of suitors for his services come July 1. Projected Cap Space: Ottawa only has around $60MM committed for next season, and with the cap ceiling expected to climb to something around $80MM there is plenty of room for Stone and Ceci to be re-signed without hamstringing the team on the free agent market. That said, the Senators have never been a team to spend heavily on big name free agents and have an owner that sets an internal budget separate from the league’s cap. After a season at the bottom of the league without playoff revenue, it’s not clear how flush with cash the Senators will be this summer. The Ottawa Senators may be struggling in the standings, but that didn’t stop the team from holding their annual skills competition at the Canadian Tire Center with forward Mike Hoffman and defenseman Fredrik Claesson each winning the key awards of the afternoon, according to Ottawa Sun’s Bruce Garrioch. Hoffman captured the speed award with a time of 13.944 seconds, just short of his time a year ago (13.836) when he won the same event. Ryan Dzingel finished second in the competition at 14.016 and Thomas Chabot placing third at 14.229. “I always did power skating as a kid and played inline hockey growing up, which can help on your skating as well,” Hoffman added. Claesson won the hardest shot competition at 104.6 mph in the preliminary rounds and then beat fellow defenseman Johnny Oduya in the finals with a 103.7 shot. Oduya had a 98.0 mph shot. Larry Brooks of the New York Post recommends that in the wake of the Chris Kreider injury and the fact he could be out for two months, the New York Rangers should look into the price of acquiring Arizona Coyotes forward Anthony Duclair, a perfect buy-low candidate. With few options in the AHL, a cheap player with NHL experience might be perfect for New York. Pointing out a suggested trade for Duclair as well, Tampa Bay Times’ Joe Smith also likes the idea of the Tampa Bay Lightning kicking the tires on acquiring the 22-year-old winger. Smith writes he would be a perfect low-risk, high reward option as a top-nine player for a team to fill out its depth. However, the scribe does add the team might want to focus more on defensive depth first, such as Ottawa’s Codi Ceci. With the Washington Capitals victory Saturday, head coach Barry Trotz recorded his 737th victory, making him the fifth winningest coach in NHL history. Trotz, who is in his 19th year as a head coach, has 180 victories with the Capitals. He had spent the previous 15 years in Nashville. Another ruling has come down from the NHL’s Department of Player Safety, this time suspending Fredrik Claesson of the Ottawa Senators for two games. Claesson hit Boston Bruins forward Noel Acciari in the head last night and was ejected from the game, and will now have to sit for a while longer. Rather than delivering a full-body hit, Claesson takes an angle of approach that makes Acciari’s head the main point of contact on a hit where such head contact was avoidable. Claesson has never received any supplementary discipline from the league in the past, but has only played 80 games so far in his NHL career. The league wants to shut down any plays like this right away, as targeted head hits are a point of emphasis for the DoPS. Claesson has turned into a useful and physical defender for the Senators, but will have to walk the line more carefully in the future. He’ll be available for their January 3rd game against the Detroit Red Wings. In the meantime, expect Ben Harpur to enter the lineup. The Ottawa Senators are in for a tough decision come the completion of their playoff run, whenever that might be. Ottawa has a team which is built upon depth and scoring by committee, but each NHL team can only protect 7 forwards, 3 defensemen, and 1 goaltender – or alternatively, 8 total skaters and 1 goaltender in the upcoming expansion draft. The Senators are in a situation where they will likely prefer to lose a veteran with a large contract. This seems doubly true because the organization is believed to have an internal cap for financial reasons, and will need to clear space in order to hand out hefty raises to Mark Stone and Kyle Turris following the 2017-18 campaign. That leaves 3 forwards and 1 defensemen, or, alternatively, 2 total skaters to protect. It seems somewhat unlikely (although not impossible) that they will opt for the latter option. If we look at the potential list of who can be protected, there are no easy answers. Up front, Alexandre Burrows seems to have been a solid fit, as he has played well since being promoted to Turris’ right wing on the top line, and his cap hit drops to a measly $2.5 MM going forward. Zack Smith has been a more-than-capable third-line center, and is signed to a cap-friendly deal for four years after this. Bobby Ryan is incredibly overpaid ($7.25 MM) considering his performance this past year (25 points), but has expressed his profound disappointment in his own season to the relative acceptance of the fanbase. It doesn’t hurt his cause that he has been Ottawa’s best skater this post-season by far, leading the team with 7 points through 6 games. Jean-Gabriel Pageau and Ryan Dzingel could also receive consideration for a protected forward spot, but only one is likely to remain unguarded. In terms of defense, Dion Phaneuf has a bloated contract which would be especially helpful to be rid of. Phaneuf is getting an absurd $7 MM per year , but he is on the “must-protect” list due to his modified no-trade, no-movement clause. The team could ask him to waive, but considering his solid play of late, this is more difficult to conceive. There is also no guarantee that Vegas would be interested in the player. The up-and-coming Fredrik Claesson is exempt from the expansion draft and needs no protection. Therefore, it seems likely that Methot ($4.9 MM) will be the odd man out, as he would likely be exposed in the 7-3 option. This would be a difficult pill for Ottawa fans to swallow, as Methot has arguably been their best shutdown player and he logs a ton of tough minutes. For a team that has worked so hard to shore up its back-end and add depth up front, there are no easy solutions for GM Pierre Dorion. If you lose Methot, you lose your best defensive defenseman – if you expose a resurgent Ryan, you surrender a creative offensive weapon. Either way, Vegas is likely going to pick one of its integral players from Canada’s capital city. The Globe and Mail and TSN both contemplate what the future might hold for the vanquished Montreal Canadiens, following a disappointing first-round exit at the hands of the New York Rangers Saturday night. Marc Bergevin could conceivably be on the hot seat in spite of his team’s Atlantic division title, but the firing of former coach Michel Therrien likely extended his tenure. The P.K. Subban trade is quite the easy target for criticism, although the squad’s defensive stats took a large leap upward since Shea Weber’s acquisition. Even Carey Price appears not to be immune from fan criticism, though it hardly seems Price could have done much more to assist his floundering offense. Max Pacioretty is sure to draw ire as well, as his 0 goals and 1 assist through 6 games was incredibly underwhelming. The team has an awful lot of contracts coming off the books, and the organizational vision will now be more important then ever. Impending UFAs include Alexander Radulov, Dwight King, Brian Flynn, Steve Ott, and Andrei Markov. Assuming Radulov re-signs, there is still a glaring need for another potent offensive weapon to assist Pacioretty. With Tomas Plekanec having only one year remaining on his deal, and Alex Galchenyuk constantly receiving demotion, strength down the middle is an issue. A top-flight center has to be at the top of the wish list for a squad that struggled so mightily to find consistent offense. Whether they can actually acquire one via trade (or some other means) remains to be seen. Washington defenseman Karl Alzner will miss his fourth straight game as his team faces off against Toronto in Game 6, although he did skate with the team. Alzner sustained an upper body injury prior to Game 3, and further details are unknown. Replacement Nate Schmidt has performed admirably in his absence, although Alzner’s defensive presence and ability to eat minutes is difficult to replace. Alzner is not particularly physically dominant, but he is adept at keeping scoring chances limited and to the outside. Holtby will need to be sharp in his absence with a desperate, offensively talented Toronto team looking to fire away this evening. Ottawa defenseman Chris Wideman will be replaced tonight by Fredrik Claesson. Wideman has been barely noticeable in this series, but had tallid a goal and an assist from the backend. During the season, Claesson’s Corsi numbers were slightly better than Wideman’s, while Wideman had been a little more involved offensively. Ottawa’s injured left winger Viktor Stalberg may be able to return tonight, as he is a game-time decision. The big bodied winger is known for his blazing speed and penalty killing prowess. As a veteran with 48 playoff games under his belt, Stalberg would be a welcome return to bolster Ottawa’s already formidable forward depth. It is undetermined who would sit out in his place. While Arizona and Calgary finish the details on a trade featuring a free agent defenseman, the Ottawa Senators have re-signed one of their own. The team announced today that they’ve signed Fredrik Claesson to a one-year extension worth $650,000. Claesson has played just 19 games for the Senators this season, and was still a restricted free agent at the end of the season, making the timing of the extension interesting. Claesson would need to play at least 21 of the remaining 25 games this season to qualify as the 40/70 defenseman Ottawa needs to expose at the draft, but it looks like they’ll have plenty of options to fill that requirement. They already have some interesting decisions to make on their back end. A former fifth-round pick, Claesson has been dressing as a seventh defenseman recently for the Senators, playing just a few minutes a game. After possibly losing four forwards in two days, perhaps the team will stay with that plan for the immediate future.